PERFECT FOR A SUBSTITUTE TEACHER - EVERYTHING YOU NEED IS HERE! IF YOUR STUDENTS ARE NOT USING COMPUTERS IN THE CLASSROOM THEY MAY STILL DO THIS ASSIGNMENT. PRINT AND DISTRIBUTE OR USE WITH A SMART BOARD AND ENGAGE THE ENTIRE CLASS. ➢ 15 multiple-choice test with questions and answers - (the test is a separate PDF). ➢ The story itself as a PDF - with very cool images. ➢ 24 Interactive Google Slides - two different assignments - you simply share the file with your students and they answer the questions on their computers. 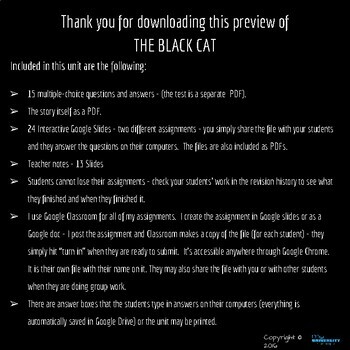 The file on "The Black Cat" group work is also included as a PDF - the other file may be downloaded as a PDF. ➢ PLEASE SEE THE PREVIEW FOR INFORMATION ON THE ASSIGNMENTS. One assignment is group work and the other assignment students do either before or after their group assignment. The second assignment may be done in groups, alone, as homework, or during class time. Students explain what is wrong with other examples from “The Black Cat.” The examples contain assertions, non sequiturs, grammatical mistakes, or are not clearly written. I find this a helpful tool to do before they create their own presentations. 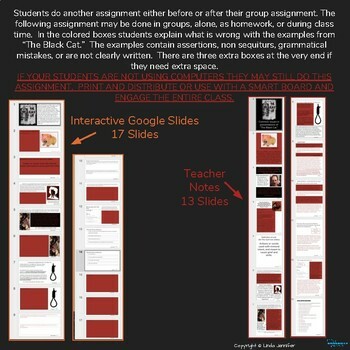 ➢ Teacher notes - 13 Slides (answers to the second assignment). ➢ Students cannot lose their assignments - check your students' work in the revision history to see what they finished and when they finished it. ➢ I use Google Classroom for all of my assignments. 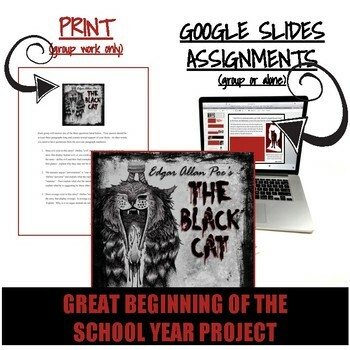 I create the assignment in Google slides or as a Google doc - I post the assignment and Classroom makes a copy of the file (for each student) - they simply hit “turn in” when they are ready to submit. It’s accessible anywhere through Google Chrome. It is their own file with their name on it. 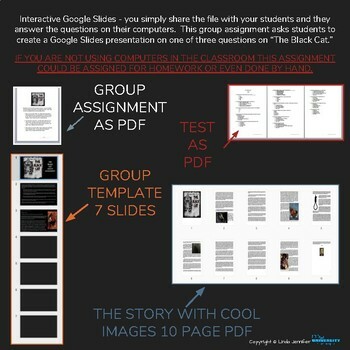 They may also share the file with you or with other students when they are doing group work. ➢ There are answer boxes that the students type in answers on their computers (everything is automatically saved in Google Drive) or the unit may be printed. CCSS.ELA-Literacy.RL.8.1; 9-10.1; 11-12.1 Cite the textual evidence that most strongly supports an analysis of what the text says explicitly as well as inferences drawn from the text. CCSS.ELA-Literacy.RL.8.4; 9-10.4 Determine the meaning of words and phrases as they are used in a text, including figurative and connotative meanings; analyze the impact of specific word choices on meaning and tone, including analogies or allusions to other texts. CCSS.ELA-Literacy.W.8.1 Write arguments to support claims with clear reasons and relevant evidence. CCSS.ELA-Literacy.W.9-10.1: W 11-12.1 Write arguments to support claims in an analysis of substantive topics or texts, using valid reasoning and relevant and sufficient evidence. CCSS.ELA-Literacy.W.9-10.2: 11-12.2 Write informative/explanatory texts to examine and convey complex ideas, concepts, and information clearly and accurately through the effective selection, organization, and analysis of content. I teach Poe's "The Black Cat" as a TEXTURE TEXT or a CONTEXT TEXT usually alongside NIETZSCHE. It is an excellent story to use when studying philosophical concepts including, but not limited to, the following: justice, law, insanity, revenge, and more. •	Look for the green star near the top of any page within my store and click it to become a follower. Voila! You will now receive customized email updates about this store.